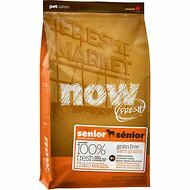 Give your elder furry friend a diet packed with protein with Fit + Free Grain-Free Chicken, Turkey & Trout Recipe Senior Dry Dog Food from Go! This food contains 100% fresh chicken, turkey, trout, duck and salmon, as well as premium quality chicken, turkey, salmon, duck and herring meals. This grain-free recipe provides complete and balanced nutrition including fruits and veggies, with antioxidants to support immune system function. With no by-product meals, added growth hormones, artificial preservatives, wheat, corn or soy, you can feel confident feeding your old pup a diet that will keep him going strong. Made with 100% fresh meat and premium quality meals. Added green mussels and glucosamine/chondroitin support hip and joint health. Probiotics and prebiotic fiber promote healthy gut bacteria and good digestion. Contains taurine, which aids the vision and heart health of your pup. Chicken Meal, Turkey Meal, Salmon Meal, De-Boned Chicken, De-Boned Turkey, De-Boned Trout, Potatoes, Peas, Tapioca, Lentils, Chickpeas, Pea Fiber, Chicken Fat (Preserved With Mixed Tocopherols), Duck Meal, Natural Chicken Flavour, Whole Dried Egg, Apples, Herring Meal, Flaxseed, Salmon Oil, Alfalfa, De-Boned Duck, De-Boned Salmon, Sweet Potatoes, Potassium Chloride, Pumpkin, Carrots, Bananas, Blueberries, Cranberries, Broccoli, Blackberries, Squash, Papayas, Pomegranate, Glucosamine Hydrochloride, Dried Chicory Root, Dried Lactobacillus Acidophilus Fermentation Product, Dried Enterococcus Faecium Fermentation Product, Dried Aspergillus Oryzae Fermentation Extract, Dried Bacillus Subtilis Fermentation Extract, L-Carnitine, Choline Chloride, Vitamins (Vitamin A Supplement, Vitamin D3 Supplement, Vitamin E Supplement, Niacin, L-Ascorbyl-2-Polyphosphate (A Source Of Vitamin C), D-Calcium Pantothenate, Thiamine Mononitrate, Beta-Carotene, Riboflavin, Pyridoxine Hydrochloride, Folic Acid, Biotin, Vitamin B12 Supplement), Minerals (Zinc Proteinate, Iron Proteinate, Copper Proteinate, Zinc Oxide, Manganese Proteinate, Copper Sulphate, Ferrous Sulphate, Calcium Iodate, Manganous Oxide, Selenium Yeast), Sodium Chloride, Taurine, New Zealand Green Mussels, Yucca Schidigera Extract, Chondroitin Sulphate, Dried Rosemary, Green Tea Extract, Peppermint, Parsley, Rosehips, Zedoary, Dandelion, Chamomile, Ginger, Fennel, Turmeric, Juniper Berries, Licorice, Marigold Extract, Cardamom, Cloves. The amount of food your cat needs will vary depending on breed, activity level, age and climate. 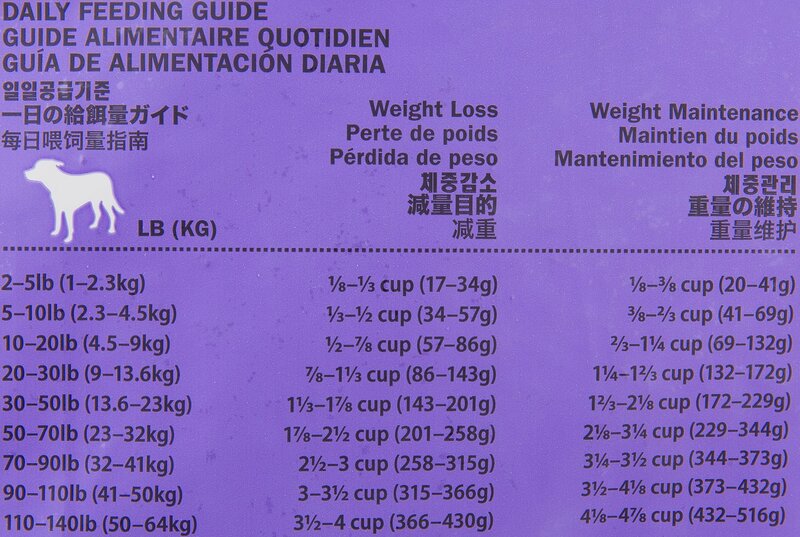 Use our feeding chart as a guide, adjusting the quantity fed to achieve your cat's ideal weight. We suggest feeding twice a day. Provide fresh, clean water at all times. Regular exercise will help maintain a healthy body weight. Love, attention and tummy rubs should be given freely, as often as possible. Not sure about this food. 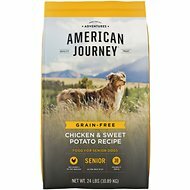 Introducing this food to my dog the first day, she threw up all night. Cost me more to go to the vet than the food. Can’t be sure that it was the food, but nothing else was new. Fantastic for my little senior dachshund! My little guy is 13 and going strong! He acts like a puppy on this food! I love the ingredients, too. He doesn't LOVE the taste or texture of the food very much, but BECAUSE he's not super crazy about it, he eats it at a very healthy rate on his own (Not too much, not too little). The kibbles are a little big and hard, but that is good for keeping his teeth clean. Great food, and I definitely recommend it!!! 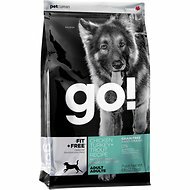 Recently switched my senior dog, Kuma (17 years young), to this brand and product line. AMAZING RESULTS!!! She is old, and sleeps MOST OF THE DAY, but when she is up she has a new pep in her walk, wants to play again, and is at the door waiting for me when I come home from work (been a few years since that has happened). She has a new sunny disposition since I switched to this brand. I have a senior overweight cocker spaniel. Love of my life. I had been struggling to find a food that 1st he didn't get tired, 2nd was special for senior dogs and helped with his over weight. Go does it all. I don't think I will order another brand I do wish they had a bigger flavor variety just to spicy things up. One of the BEST dog foods! Excellent dog food. Dogs love it. This food is fed to my 2 seniors: large dogs, eight and nine years old . It has kept fresh and the dogs love it. I especially like the large kibble size. Coats are shiny, no stomach issues. Will order it again! One of three dogs like this food. She is doing well on it. My 3 dogs enjoy this both added to their daily food and as training treats. I like the ingredient list and the "novel" protein, trout. My only exception is the alfalfa. 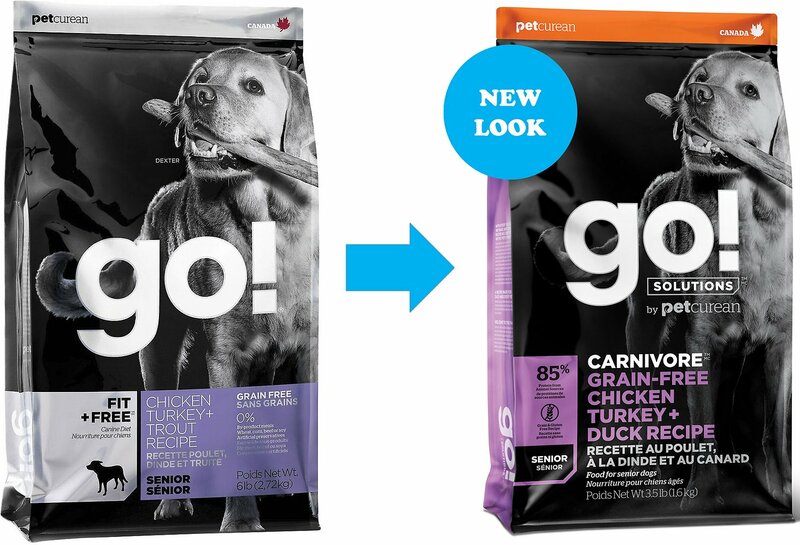 This is not the only company I noticed recently adding this grazing animal's standard to dog food, and I don't care for the practice. So this gets 4 stars instead of 5, and I will continue to look at other foods. I get the senior. Have only used it a few weeks, but I like it and my dogs do, too. It's high in meat protein; the manufacturing plants are EU certified; no byproducts, of course, and the dogs actually crunch the pieces based on the size and shape of the kibble (not too big, not hard to swallow). I was looking for a less fattening food. One dog has hip problems, the other is about 7yo. This senior suits them both, with the extra joint supplements. I like the multiple protein sources and that it's grain-free. I expect it to help one dog's skin allergy.